Don't get caught short in the rain ever again with this simple but effective lightweight, waterproof cover. 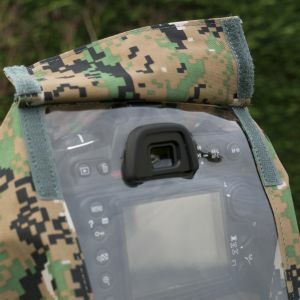 It is fast and easy to put over your camera, and folds down to a minimal size to fit neatly into the camera bag. The camouflage version is slightly heavier than the silver version, weighing in at 155g. Both feature an elasticated sleeve to incorporate the lens which can be tightened further with a draw cord. There is a large, clear panel at the rear for viewing the camera LCD monitor and flap to access the view finder. Your standard eyecup or Canon viewfinder extender can be fitted on the outside, holding the cover in place. The standard version fits all EOS cameras with lenses up to 30cm in length.